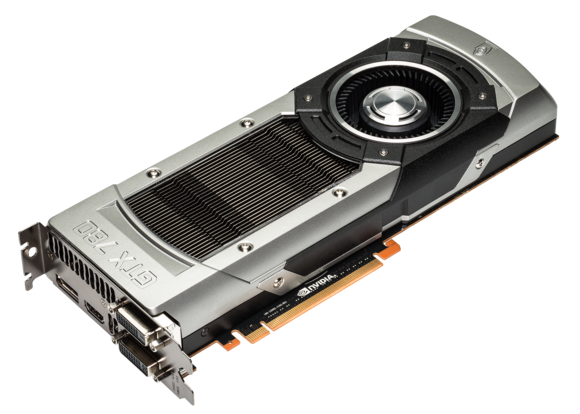 When Nvidia announced its graphical powerhouse, the $999 GeForce GTX Titan, in February, eyeballs widened. Fortunately Nvidia now offers the lower-performance GeForce GTX 780, which also cuts the price by a third, to $649. Today Nvidia will begin shipping its new enthusiast cards to partners, in the form of reference designs that its hardware partners will tweak over time. These third-party versions of the GeForce GTX 780 will be available in about a month’s time, Justin Walker, program manager for Nvidia’s GeForce, said in an interview. The Nvidia GeForce GTX 780. Nvidia claims that the GTX 780 will offer, on average, about 35 percent better graphics performance than the GeForce GTX 680, which Nvidia launched a year ago. (That card’s price now hovers at about $470, temporarily providing a lower-cost alternative if the GTX 780 is still too rich for your blood. You’ll have to move fast, though: The GTX 780 will officially replace the GTX 680.) Nvidia also claims that the GTX 780 outperforms the $400 AMD HD7970 graphics card by an average of about 30 to 35 percent; however, that AMD card debuted at the end of 2011. For gamers who really want to shell out, pairing two GTX 780 cards in SLI mode will improve performance by 75 percent over a single GTX 780 card, Nvidia said. Basically, Nvidia is positioning the GTX 780 for enthusiast PC gamers who are willing to pony up for a superior rig, running at the maximum graphics settings and screen resolutions, with high levels of antialiasing. The 780 supports both DirectX 11.0 tessellation, for improved rendering of 3D objects, and Nvidia’s PhysX physics enhancements. To assist gamers who want to plug in a GTX 780 card, sit down, and begin playing, Nvidia has brought its GeForce Experience out of beta, providing an automated configurations experience and managing the downloads and updates of Nvidia’s driver software. Buyers can expect the GTX 780 to be quieter than previous generations of Nvidia cards too, thanks to better fan management. In situations where performance demands it, however, Nvidia has added its Boost 2.0 technology, which runs the card as fast as possible within a specified temperature envelope. Nvidia's GeForce Experience hardware optimization engine is now out of beta. As to how many people are going to buy a $649 graphics card (as opposed to an entire new PC, say) analyst Jon Peddie of Jon Peddie Research says that the enthusiast graphics card market remains relatively healthy: about 3 million units were sold last year. That figure includes graphics cards that cost $250 and above, however, so it’s likely that $600 cards will slice off just a small fraction of that. Peddie said that he was quite impressed with the card’s performance. Peddie also praised Nvidia’s branding. “They could sell soap dishes and people would buy it,” he added. The numbers carve out a new high-end niche for Nvidia to play in. The GTX 780’s interior hides 12 SMX units with 2304 CUDA cores. The memory subsystem consists of six 64-bit memory controllers (with a memory bus width of 384 bits) with 3GB of GDDR5 memory. Nvidia clocks the card’s base speed at 863MHz, with the ability to accelerate, via Boost technology, to 900MHz. The memory speed that the GTX 780 uses is 6008MHz. It consumes 250 watts. What does all this mean? Well, PCWorld hasn’t officially tested it, but the GTX 780’s performance shouldn’t be too far off that of the Titan, for the price: The GTX falls short of the Titan by 384 CUDA cores, though its the memory size is just 3GB, versus 6GB for the Titan. Remember, however, that the Titan is also one of the underpinnings of “Titan,” Oak Ridge National Laboratory’s supercomputer—and the fastest in the world. The board itself is 10.5 inches long, and includes two dual-link DVIs, a HDMI connector, and a DisplayPort connector, to boot. Nvidia has improved the GPU Boost capabilities within the new card, so it can run as fast as possible without overheating. Early versions of the Boost technology were essentially the same as Intel’s Turbo Boost and other overclocking techniques used across the industry: They ramped up clock speeds as fast as possible, within a given power envelope, which meant that exceeding that power threshold could raise chip temperatures to dangerous levels. With Boost 2.0, Nvidia now uses on-chip thermal sensors for more accurate measurement. Boost 1.0 and Boost 2.0 are essentially the same, but Nvidia replaced the power target with a specific temperature target: 80 degrees C. If Nvidia’s on-chip logic thinks that the temperature will soon exceed that figure, the chip steps down its clock speed until it reaches a safe point. Boost 2.0 also includes new tools for tweaking the GTX 780’s performance. Users can increase the thermal temperature limit to increase performance further. Nvidia said that it would not allow a second type of performance increase, known as overvoltaging, on its own cards. Third-party cards may include this feature, however, enabling users to increase the chip’s operating voltage, and thus permitting increased clock multipliers. But using this feature does pose a risk of damaging the GPU, and users must acknowledge the risk before they can unlock the technology. Realistic waves, realistic faces: Two technologies the GTX 780 is designed to accelerate. Longtime Nvidia customers who purchased early GeForce cards will appreciate that Nvidia has made a concerted effort to reduce the GTX 780’s fan noise. The GTX 780 includes the same heat sink that the Titan does: a copper vapor chamber and dual-slot aluminum heatsink along with a blower-style fan. In all, it generates about 43 dBA, versus the 48 or so dBA that the GTX 680 produced. In part, the lower number is due to the on-chip temperature sensor that Nvidia included, which helps keep the fan on when the chip needs cooling and off when it doesn’t, thereby minimizing noise. In addition to the new Boost 2.0 capabilities and software, users are likely to notice the GeForce Experience—previously a beta-only piece of software that Nvidia says was downloaded more than 2.5 million times. The Experience software automatically sniffs your hardware and the game you’re playing, and attempts to optimize one for the other. It currently supports more than 70 games, and Nvidia said that it plans to roll out more, along with support for its Project Shield technology. Nvidia also said that it will ship a software utility called ShadowPlay that will automatically record the last 20 minutes of gameplay so a player can send the clip to his friends or rivals, a feature that cloud gaming companies such as OnLive first introduced. In a nutshell, Nvidia’s new GTX 780 is designed to accelerate technologies that the company has called “WaveWorks” and “FaceWorks,” containing improved techniques for rendering surfaces like oceans and faces, respectively. Nvidia hopes that these next-generation graphics technologies will appear in future games. For that reason, don’t expect Nvidia to bundle any free games with its new GTX 780 cards, Walker said. Additional reporting by Michael Brown.